My Team’s Best Bets – this is a new out-of-the box view that shows a Salesforce user the Best Bets for all users under his/her role in the Salesforce hierarchy. What this means is that now, as a sales manager, you can monitor how and if your reps are following up on the leads assigned to them. What better way for a sales manager to hold reps accountable for following up on the sales leads assigned to them! 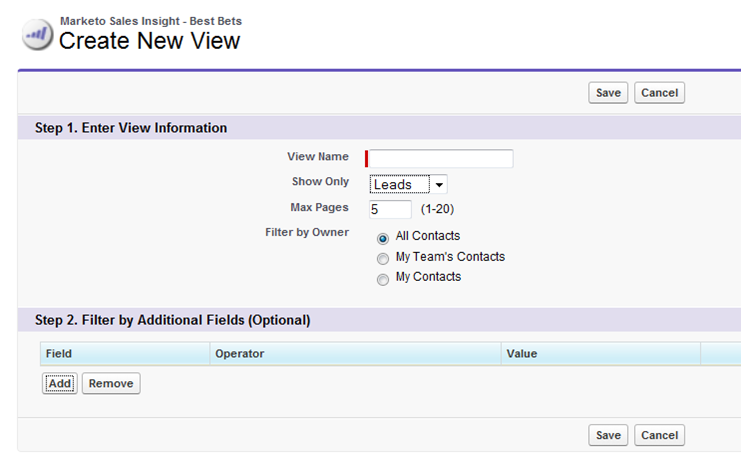 Custom Views – you can now set up views in Sales Insight that show you Best Bet leads even if you don’t own the leads themselves. This is especially helpful when you want different sales teams to identify new and collaborate on revenue opportunities. For example, a product sales rep and a services sales rep can work together to drive cross-sell revenue on an ongoing basis. The services rep can setup a custom view showing him the list of Best Bet leads for a complementary product. He could then either add those Best Bets to a special lead nurturing marketing campaign for complementary services offerings, setting the stage for a potential up-sell in the future. Better yet, he could also proactively reach out to the product sales reps who actually own those Best Bet leads to craft a bundled offer and jointly work the lead. Custom Views can be setup by an end user or by an administrator on behalf of the end users. Hiding Best Bets – What happens if a sales rep follows up on a Best Bet and discovers that the lead isn’t as ready to buy? For example, maybe the lead said they’re pushing their product evaluation out by a month. The sales rep can now use the “Hide” button to put the lead on hold. After 30 days, the system will show the lead in the reps Best Bets list again. This ensures that the sales rep focuses on the Best Bets that he owns. So, there you have it. Are there any other thoughts as to how these new features will help in your organization?